Dinosaurs evolved during the Mesozoic Era from about 251 million years ago (Ma) to 65.5 million years ago. The rise of the dinosaurs started in a world with little oxygen after the Permian-Triassic mass extinction 251 million years ago, which killed 90% of ocean dwellers and 70% of land plants and animals. This was Earth's worst mass extinction — atmospheric oxygen levels dropped from 30% to 12%. Modern birds, which are descendants of the dinosaurs, still show the adaptation to survive in low oxygen levels as they fly at heights of up to 10,000 meters (33,000 feet) in their migrations across the Himalayas. All non-avian dinosaurs became extinct 65.5 million years ago as a result of climatic changes caused by the Deccan Traps volcanic eruptions in India and a large meteorite impact in Mexico's Yucatan peninsula. The Mesozoic Era is divided into three periods. During the Triassic Period (251 to 199.6 Ma) the land was populated by reptiles, and one subclass of them, the Archosauria, evolved to give rise to crocodilians, flying reptiles, dinosaurs and birds. The Triassic was also the time when the first mammals, such as Morganucodon appeared. The transition between the Triassic and the Jurassic Period is associated with a large magma flow in the Central Atlantic province that occurred during the breakup of Pangaea and the formation of the Atlantic Ocean. The end of the Triassic was marked by an extinction event that killed more than 20% of all marine families. The Jurassic Period (199.6 to 145.5 Ma) was populated by dinosaurs that were giant herbivores and vicious carnivores. Flying reptiles (Pterosaurs) appeared and the first birds like Arcaeopteryx also appeared. The Cretaceous Period (145.5 to 65.5 Ma) was marked by active crust plate movements. Africa and India separated from Antarctica, and South America separated from Africa. During this period, flowering plants and social insects like bees and ants appeared. The first birds with beaks without teeth also appeared during the Cretaceous. Large herbivores and Tyrannosaurus rex thrived during the late Cretaceous until an asteroid impact caused the extinction of the dinosaurs and the transition to the Cenozoic Era, which is our current era. Within five million years after the extinction of the dinosaurs, mammals prospered and diversified, and 70% of new bird lineages evolved. Dinosaurs are classified into two primary branches, Saurischia and Ornithischia, based on the anatomy of their pelvic structure. Saurischians ("lizard-hipped", from the Greek sauros meaning "lizard" and ischion meaning "hip joint") have a hip structure with a pubis bone directed forward. Birds evolved from Saurischian dinosaurs. Ornithischians ("bird-hipped", from the Greek ornitheios meaning "of a bird" and ischion meaning "hip joint") had a pelvis that superficially resembled a bird's pelvis with the pubis bone pointing to the rear. Ornithischia includes a variety of species which were primarily herbivores. The backwards pointing pubic bones of ornithischians resemble those of birds. The second trait that distinguishes ornithischians is a special bone in the lower jaw, called the predentary which was an adaptation for clipping off plant material and enabled a vegetarian lifestyle. A new analysis of dinosaurs and their near relatives concludes that the ornithischians need to be grouped with the theropods, to the exclusion of the sauropodomorphs. It has long been known that birds with their particular hip structure evolved from theropod dinosaurs with their lizard-like hips. The re-grouping of dinosaurs proposed in the new analysis shows that both ornithischians and theropods had the potential to develop a bird-like hip arrangement at different times in their evolution. The bird-hipped dinosaurs, which appeared to have nothing to do with bird origins, actually belong in the ancestry of living birds. The saurischians form two major groups. The Theropoda were bipedal carnivores (meat eaters that walked on two legs), and the Sauropoda were large quadruped herbivores (plant eaters that walked on four legs). The theropods (meaning "beast-footed") dinosaurs were a diverse group of bipedal dinosaurs that could be as small as a chicken or as large as the enormous Tyrannosaurus. Theropoda were primarily carnivorous, but some theropod groups evolved to also eat plant seeds, fruits and insects. 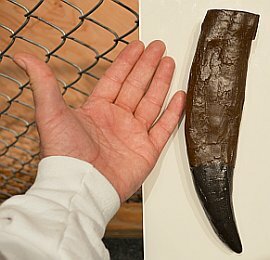 Dinosaurs shed their teeth throughout their life, like modern sharks. Adult velociraptors had a long tail and measured up to 6.8 feet (2 meters) from the head to the tip of the tail. 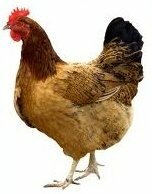 These dinosaurs were covered with feathers and had an enlarged sickle-shaped claw on each hind foot. DNA studies have conclusively shown that birds are actually the descendants of small non-flying theropods. Tyrannosaurus rex was one of the largest carnivorous therapods of the Cretaceous period. A specimen could measure up to 12.3 meters (40 ft) in length, have a height of up to 4 meters (13 ft) at the hips, and weigh up to 6.8 metric tons. 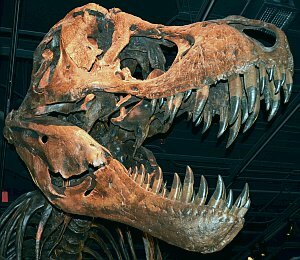 Tyrannosaurus rex is one of the best-known dinosaurs because its enormous size and ferocity have been the topic of movies such as Jurassic Park . Dinosaurs lived primarily on land, but Spinosaurus aegyptiacus, a giant predatory dinosaur, had adaptations for a semiaquatic lifestyle. Unlike terrestrial theropods, the pelvic girdle of Spinosaurus was downsized, the hindlimbs were short, and all of the limb bones were solid without an open medullary cavity, for buoyancy control in water. Its short, robust femur with hypertrophied flexor attachment and the low, flat-bottomed pedal claws are consistent with aquatic foot-propelled locomotion. The Sauropodomorpha (meaning "lizard-footed forms") were herbivorous, saurischian dinosaurs that include the sauropods and their ancestral relatives. These dinosaurs were large herbivores with very long necks, long tails, small heads, and thick, pillar-like legs reminiscent of the limbs of elephants. The nostrils of these animals were located high up on the skulls, rather than being located at the end of the snout like in many other terrestrial vertebrates. Some of the sauropods had a rudimentary body armor consisting of skin calcifications called osteoderms. 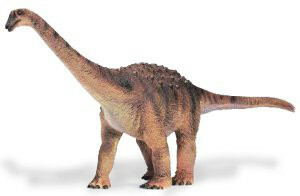 Apatosaurus, a sauropod previously known as Brontosaurus, lived from about 154 to 150 million years ago, during the Jurassic Period. Ornithischia were beaked, herbivorous dinosaurs that sometimes lived in herds and were frequent prey animals for the theropods. The predentory bone at the tip of their lower jaw helped to form a cropping beak that was used for slicing off plant stems and this allowed the teeth in the back of their jaws to become specialized for grinding and chewing. 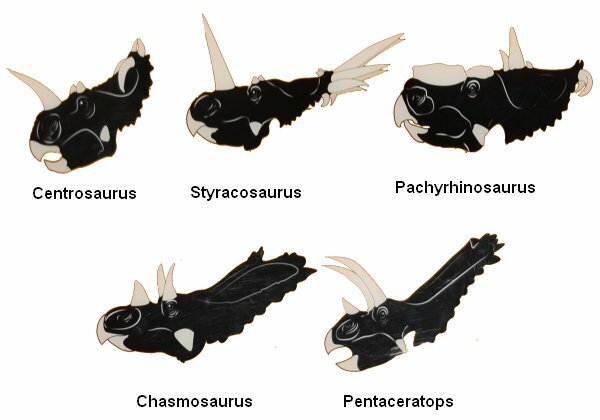 The Ornithischia family tree is divided into the Thyreophora ("shield bearers" or "armored dinosaurs") that include the branches Stegosauria and Ankylosauria, and the Neornithischia ("new ornithischians") that include the branches Ornithopoda, Ceratopsia and Pachycephalosauria. Stegosaurs ("covered lizards") lived during the Jurassic and early Cretaceous period mostly in the Northern Hemisphere, predominantly in what is now North America, Europe and China. The Stegosauria were herbivorous ornithischian dinosaurs that had complex arrays of spikes and plates running along their backs, hips and tails. These bony plates were not part of the skeleton; they were skin ossifications called osteoderms. 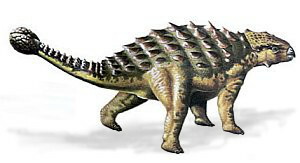 The spikes in the tail consisted of an arrangement of four to ten spikes that were used for defense. Stegosaurs walked on all four legs, although their front legs were substantially shorter than their back legs. The head was very small compared to the rest of the body, and it was carried close to the ground. Stegosaurs had a very narrow beak and leaf-shaped teeth. Stegosaurians became extinct during the first half of the Cretaceous period. Ankylosauria ("stiff lizards") is a group of herbivorous ornithischian dinosaurs that includes the great majority of dinosaurs with armor in the form of bony osteoderms. 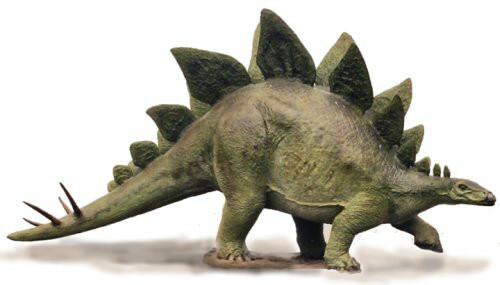 Ankylosaurs were quadrupeds, with bulky fat bodies and short, powerful limbs. Their skulls were wedge-shaped with angular edges, and their teeth were small and leaf-shaped. In some but not all Ankylosaurs, the end of the tail was modified to form a tail club with huge osteoderms that was used for defense. The ornithopoda ("bird legged") include the duck billed hadrosaurs and iguanodons which evolved complex dentations for shearing and grinding plants. Iguanodons were a very populous group of ornithopods with many species known from the Middle Jurassic to the Early Cretaceous. Iguanodons had a characteristic spiky thumb whereas hadrosaurs had a hand that was encased in a mitten of skin. Some hadrosaurs had elaborate crests on the top of their skulls, while others had flat heads. 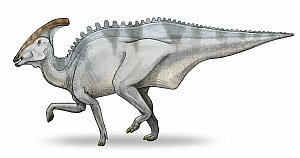 Hadrosaurids, or duck-billed dinosaurs, were common herbivores in the Cretaceous Period of what is now Asia, Europe and North America. 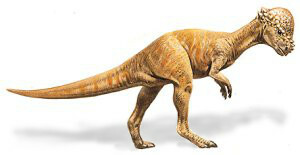 Hadrosaurids are descendants of the earlier iguanodontian dinosaurs and had a similar body layout. the ceratopsians ("horn faced") include the well-known Triceratops. These plant-eating dinosaurs walked on four legs and had relatively short tails compared to other dinosaurs. The frill at the back of the head was made up of bones from the back of the skull that became very elongated and protected the neck. Many of the ceratopsians also had horns over their eyes and their beak resembled a parrot's beak, but the jaw still had elaborate banks of teeth for shearing and crushing plant material. The earlier forms of ceratopsians did not have quite as elaborate frills and horns as the later forms. Ceratopsids had a wide variety of horns, knobs and frills. Ceratopsids had elaborate horns and frills. These characteristics are the principal means for recognizing various species. The large horns and frills may have been used as a defense against the large carnivorous predators like T. rex, but they may have also served as displays for attracting mates or to combat competing suitors. Pachycephalosauria ("thick headed lizards") is a clade of ornithischian dinosaurs that lived during the Late Cretaceous Period, in what is now North America and Asia. These dinosaurs had a high domed skull, but their brains were not very big. Most of the volume of the skull was solid bone. It is thought that these dinosaurs used their heads as battering rams against other members of the same species when competing for mates or defending territory. Examination of the skull of a specimen of Pachycephalosaurus wyomingensis found cranial lesions that are consistent with agonistic behavior in pachycephalosaurs. Dinosaurs and other organisms, whether living or extinct, are named according to a set of rules established by Carl Linnaeus, an 18th century Swedish scientist. The names consist of two parts representing the genus and species. These binomial names are printed in italics and the first part is capitalized. 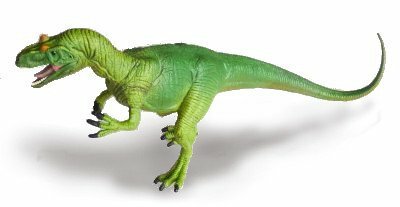 Thus, Tyrannosaurus rex is the name of a carnivorous therapod that lived during the Cretaceous Period. The binomial names usually describe notable features of the organism in Latin, although some of the name roots may be Greek. Tyrannosaurus means tyrant lizard and rex means king. Triceratops means three horned face. The following table lists some of the most common roots used in dinosaur names.